It might have been seen as a form of expressive penal servitude. The UK Foreign Secretary’s position is usually one of the more prestigious ones. Even with Britain being a faded power, a historical scarecrow relative to its former meatier self, the position remains relevant. Given the Brexit vote, the office has assumed even greater importance, though the new Prime Minister Theresa May was careful to make sure a separate cabinet position was created specific to those consequences. The reputation of the new office holder, Boris Johnson, is not that of dedicated industriousness and organisation, and floundering through history is not necessarily a tradition that will assist him. David Davis, for that reason, will be keeping a close eye over him at close quarters. The recipe of being the stand up comic has been Johnson’s preferred form of engagement. At times, it is a wonder whether he is, like figures such as Russell Brand and Eddie Izzard, a comedian turned politician or a politician turned comedian. In the wrong transformation, seriousness, or an undue comic turn, can prove fatal. Johnson’s manner wins him followers; it provides reels and loops of entertainment and cringe worthy moments in equal measure. Underlying it is a sense that the British private school boy might still run the show, pulling strings of empire that have long been loosened, if not severed. Nothing will save Johnson from the nest he has made for himself. Having been economical with a range of figures in the pro-Brexit campaign, he is showing signs of claustrophobia when confronted by them. His first major press conference as Foreign Secretary, held alongside US Secretary of State John Kerry, caused visible emotional tension. Prior to it, Johnson had suggested that Kerry walk headfirst into the Number 10 door, the price of entertainment, even between officials of the “special relationship”. Kerry was not obliging. 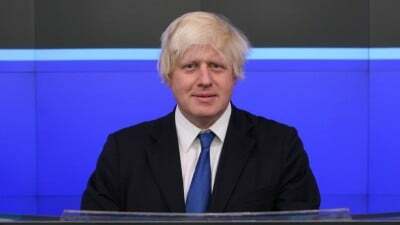 The press conference brought to light another side of the May gamble: to place Boris before the proverbial press firing squad, and witness how he would fend off the criticism. As far as descriptions go about the deeply sociopathic complex of the Clinton establishment, that description of Hillary was as good as any. But given that Johnson was fronting now, not as polemic scribbler, but British representative on foreign affairs, the point was clear: humour and cutting observations have no place in such dry matters of state. More to the point, dumping on a potential future leader of the “free world” is bound to rile a good many in freedom land. Johnson preferred a different manoeuvre, which was a vain attempt to bring the conservation back to the straight road. There were serious matters to discuss. “I’d think we’d all much rather talk about Syria.” Or not, as the case seemed, when Johnson decided to lob a few other distracting bombs by confusing Turkey with Egypt on no less than two occasions. The issue of exaggeration was also bound to come up. The New York Times representative pointed out in its question “an unusually long history of wild exaggerations and frankly outright lies that I think few foreign secretaries have prior to this job.” What would Mr Kerry think about that? Johnson has shown himself to be a fire that burns with inspiration in the scandal of the moment, drawing strength from such publicity fanning moments as hosting the satirical news program Have I Got News For You. That program, team captains Paul Merton and the editor of Private Eye, Ian Hislop, reflect, did much to launch his career. They rue that fact to this day. In what is also another gamble, placing Johnson in such a setting will either have the effect of eliminating him as a future prime minister, forever condemning him to comic little England status, or embolden him as idiosyncratic, infuriating patriot. The former Mayor of London remains erratically dangerous to his opponents.